Skilled obsetrician and efficient gynaecologist who endears herself with patients. Main areas of interest are high risk obstetrics and intimate aesthetics/ cosmetic gynaecology. DNB (NBE) OBS GYNAE, Delhi. Junior and Senior Residency from DDU Hospital ,Delhi. I am elated with the service received at Apollo Cradle. Dr. Arpita Gangwani and her team had delivered best care. I had a very safe delivery. I will always be thankful to the whole team. From the very first day when we had visited Apollo Cradle, the experience we had is a memorable one. The way we were tended to and made aware of the facility, was in a hospitable manner. The staff was always supporting and helpful. Dr. Leena, Dr. Arpita, Dr. Chandrakanta are really worth appreciating. Care manager Shikha was so polite and friendly that half of your pain vanishes. The nursing staff is very gentle, and kept one so comfortable, especially nurses (Varsha and Josy), whose help will remain forever in our minds. I would love to refer Apollo Cradle to everyone, as it really feels like God’s own hands. Wishing you prosper move and more every day. Overall the experience is worth appreciating. Staff, nurses, are all very supportive, especially Renu and Teena. We had considered “Apollo Cradle” not only for the facility but the expertise and experience of Dr. Leena and Dr. Arpita. Their support can’t be expressed in words. I am extremely thankful to all for helping me reach this stage of motherhood. Shikha, Akash and team provided immense support. Thanks a lot for this, as without this support our stay would not have been so easy. Dr. Chandrakanta made it possible for me to recover with much more confidence. It was a very nice experience with Apollo Cradle as it\\\’s an excellent hospital. The staff is very caring & supportive. Dr. Leena and Dr. Arpita are very nice and soft spoken. They explain everything very patiently. Sakshi and Shikha are very nice and their hospitality is beyond expectation. 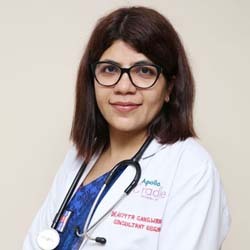 Dr. Chandrakanta made me feel proud and confident, and I enjoyed my delivery in Apollo Cradle. I will definitely refer this to my friends and relatives. Dr. Vivek Chaudhary is also very caring and supportive. I am thankful to all of them.